In a nutshell, Kat O’Neill is a pretty cool chick. She is as likely to be found taking photographs off the back of a Harley as on Main Beach in East Hampton and shares her studio with a rabbit called Little Van (Van is her son’s name.) She creates works of beauty and works of provocation across different media and isn’t afraid to stare mortality or difficult facets of life in the face. Yet she can also be stopped in her tracks by the simple daily act of a sun setting on the horizon. Along with her art, O’Neill hones her words for the stage and screen. So, how does she translate her voice across these different forms? Kat O’Neill’s journey has taken her from a successful job on Wall Street to a writing contest that landed her at advertising giant Chiat Day. Next came a focus on writing plays and screenplays, being an artist in residence in theaters in Manhattan then having her screenplays optioned for Hollywood. She got back to directing a few years ago at Guild Hall for a night of short plays she wrote titled Life is Shorts. 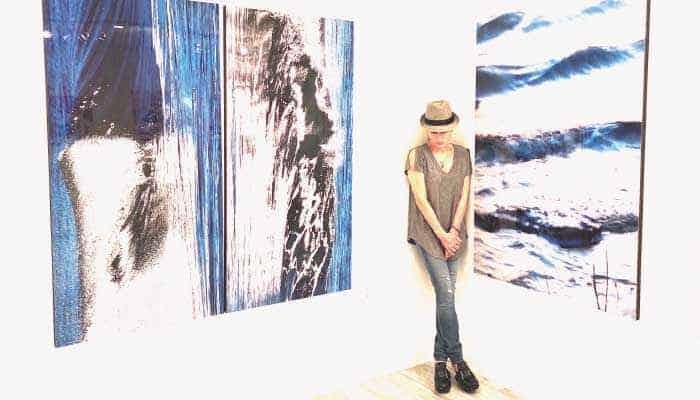 “I would like to do more plays out here,” O’Neill admits, “I think there is a real need for original works.” Now O’Neill lives in East Hampton with her husband, Marc Heskell, a real estate broker at Saunders, her rescued pup Shadow and the aforementioned Van’s.